So it has been five months since our last house update, whoops! I was going so well with posting three in a row and then it all went to pot! In my defense I think April was quite a quiet month in regards to house stuff. So maybe that’s why these posts disappeared from my brain. Although lord knows how I can try and excuse missing four posts! Anyway, things have been fairly busy over the last few months and we have a fair bit to catch you up on, so let’s dive straight into out August house update. August House Update: What’s been ticked off the list? First off the garden is flourishing! Granted there were a few missteps thanks to a frosty spell in June followed swiftly by a scorcher of a few days. But thankfully most of the plants are still doing well in our flowerbeds. So far it’s a mix of mint, lavender, sage, daisies, hydrangeas and pansies. Plus a couple of tall bush/tree things that I have no idea the names of. Oh and the latest news is that we’re now growing strawberries, courgettes and tomatoes too. Go us. Frankly I’m just amazed things haven’t completely died over the last few months. We’ve also finally sorted out the fireplace. Hooray! Anyone that’s read the other few house update posts will know that we were really not keen on that fibreglass fireplace. It was such an important thing for us to fix. Now that it’s gone and the wall has been replastered and repainted we’re just so happy. It really has made such a difference. 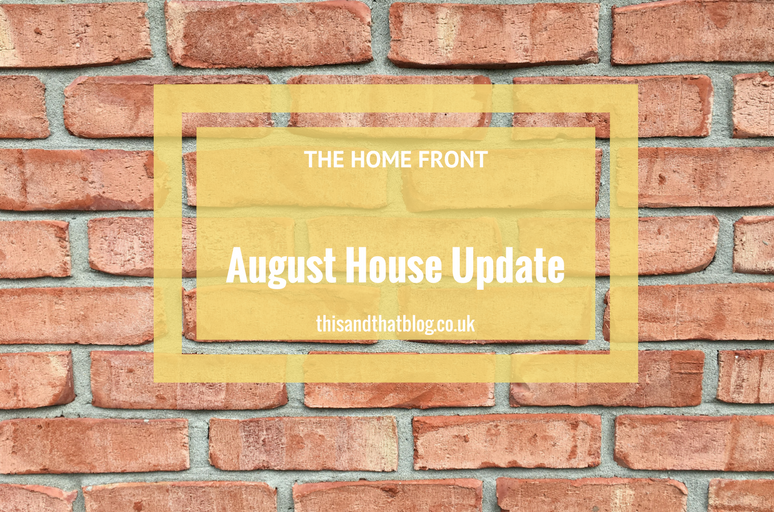 August House Update: What jobs have we progressed with? Top of this list is the living room as while the bulk of the fireplace is done and dusted we’re left with a few finishing touches. Firstly we need to choose tiles for the hearth. So far we’ve narrowed it down to the options here and here. What do you think, which one do you prefer? We want something simple and maybe with a touch of red to tie in with the sofa. Stickers seem sensible for a number of reasons. Firstly they’re cheaper than proper tiles and they’re a lot simpler to fit than ones with grout. The final reason is it means we can change our minds if we want too. As you may have spotted we’re seriously indecisive! 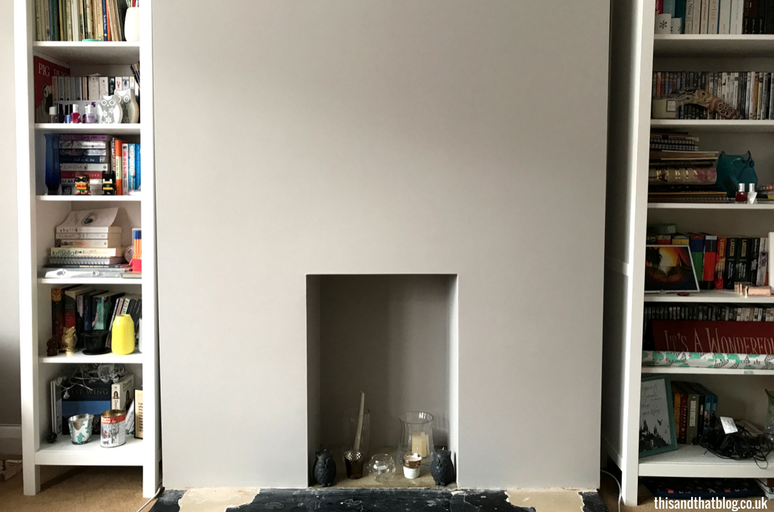 As well as tiles we also need to fit a mantelpiece of some description but we’re struggling to choose one – we just can’t decide what will work. For now we’re going to hand a picture frame there in the hopes that a mantlepiece won’t be needed! August House Update: What’s next? The what’s next question is simple to answer – it’s the kitchen. We’ve finally decided not to redo the whole thing, which you may remember was our original plan. Instead we’re going to give the cabinets a facelift, get a new oven and new work surfaces. Once we’ve saved a bit of money anyway. So for now it’s all about the investigating, getting quotes and pinning bits onto our kitchen ideas Pinterest board. Basically we’re saving ourselves £4k as a result. Go us and our adulting decisions! So there we go, not a huge amount to show you, but we’re definitely getting there. The kitchen and garden shed are the only major projects left on our house list now. Yippee!